Colorful, whimsical and fun- The Easter Egg cozies can transform cheap plastic Easter eggs into lovely little yarny treasures that you will save and reuse every year. Dress plastic eggs up as yarn eggs or as little cozy carrots to complete your Easter decorations. 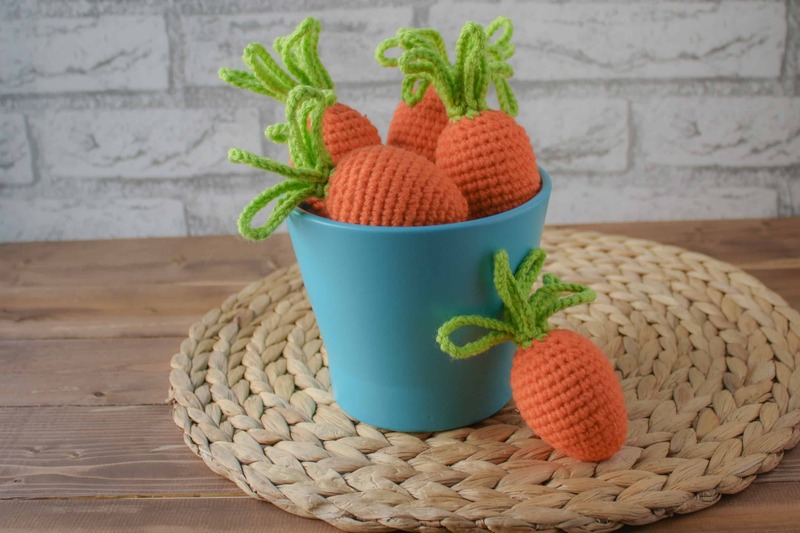 The carrots can even hang around for the spring season to add a little whimsical garden touch or crochet some white, cream or brown colored eggs for farm inspired decor. The pattern uses worsted weight yarn and can really help use up some of your yarn stash. It is worked in the round with no turning. I used a piece of constrasting yarn to mark my first stitch. I am not the faster crocheter and each egg took me about 20 minutes to complete. The finished result is a perfectly shaped egg because we are using a plastic egg for the interior instead of stuffing. You can stuff is with a poly-fil instead but I really recommend using the plastic egg. These eggs would also look darling with stitched on decoration. Just a little simply stitching would really turn up the cuteness factor. At this point turn your work inside out (optional, but I found this makes it easier to work the last few rows) and insert your plastic egg. If you are just wanting to make an egg cozy, finish off here and weave your end through the last 6 stitches, pull tight and tie off. Weave in all ends. If you want to make the top for a carrot continue to change yarn colors and continue to Round 17. Round 17: (Slst to next st, ch 28, slst to the same st) repeat from (to) 6 times. Finish off and weave your end through the last 6 stitches, pull tight and tie off. Weave in all ends. Your all done. Just add them to a basket or a bowl and set them out as decorations! Let me know how you like this pattern and if there is anything I can do to improve my pattern writing. If you have any questions leave a comment below and I will try and help the best I can. If you decide to make some Easter Egg Cozies of your own, I would LOVE to see a photo! If you share it on social media be sure to tag me @windingroadcrochet or #windingroadcrochet. Want to know what I am making next? Follow me on Instagram @windingroadcrochet to see sneak peeks of what I am up to and to be notified of when I release new free patterns. Written pattern is copyright Windingroadcrochet.com. Please do not reprint or repost this pattern as your own, but please feel free to share this link with others. You can find more information on sharing my work with others in the Terms and Conditions Page. Thanks for the egg cosy pattern….have done a few now!! ?